Congratulations to All on these Well-Deserved Honors! When collaborative design and construction teams come together with innovative owners, the community benefits from world-class, award-winning projects. It has been a good year. And as we reflect on 2018, we recognize the significant achievements of our clients and partners over the past year. Thanks to a shared commitment to safety, collaboration, innovation, sustainability and the goal of delivering the best buildings to our community, Arizona projects and owners are earning accolades from across the construction industry. We could not be prouder to have been part of many of the project teams that made the vision of each owner a reality and which our communities will enjoy and benefit from for years to come! A Salute to ASU, Honored as 2018 Owner of the Year and Project of the Year! 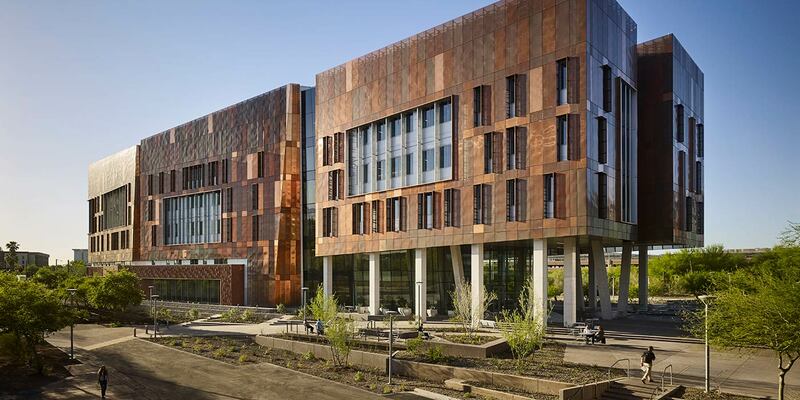 Join us in congratulating Arizona State University, which was named the owner of the Year for 2018 by ENR Southwest. Their leadership in the construction industry is highlighted through continually innovating and raising the bar for collaboration and sustainability all while managing a significant number of construction projects on multiple campuses. ASU also earned top honors from ENR Southwest for the Biodesign C building, which will house the world’s first compact x-ray laser. The research laboratory, which is the third building on the Biodesign Institute Campus, was recognized for safety, execution of its complex design and for creating innovative solutions that kept the project on-time and maintained its budget, even after significant, complex changes were made to the project. Acknowledging the Best of the Best! Congratulations to the Yuma Regional Medical Center for earning national recognition for safety and as the Best of the Best Healthcare construction project in the country. Known for being the most logistically challenging project in the state of Arizona, this rural hospital campus renovation required full removal and replacement of the original hospital, which was located in the middle of a fully operational facility. It required surgical precision to complete the project, while keeping the surrounding operating rooms, NICU, laboratory and Radiology interconnected and uninterrupted throughout all phases of construction. Congratulations also go out to the remarkable OdySea Aquarium, a circular 200,000 square-foot three-level entertainment destination in Scottsdale, Arizona that features more than 55 marine life tanks that hold two million gallons of water. The team was challenged to construct a concrete aquarium containing virtually no right-angles, using 12,000 cubic yards of concrete for its structural footings; 121 individual concrete structural columns; 1,198 steel beams and 72 concrete tilt wall panels, which were assembled over eight days on-site and placed using a 300-ton tilt plane crawler crane. The largest panel placed weighed 220,000 pounds and measures 60 feet high. There were also 16 cast-in-place concrete aquatic tanks with 5,455 linear feet of massive acrylic air and water-tight observation windows. And the project was completed in only 18 months! In addition, join us in congratulating Silicon Ranch for earning top honors Hazlehurst Solar Plant, a 52-megawatt solar facility that is having a significant impact on the local economy! The 480-acre utility-scale solar plant in Jeff Davis County generates more than 134 million kilowatt hours of renewable energy annually for customers of Green Power EMC, the equivalent of power for 8,500 homes each year. During the eight-month construction period, more than 300 workers were employed, the majority of whom are local area residents. 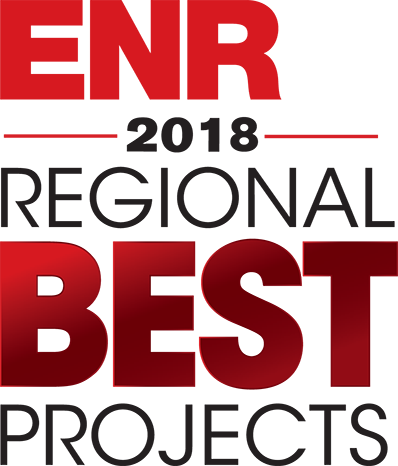 Finally, we are thrilled to announce that the city of Chandler was honored with 2018 Water/Environmental Best Project for its Ocotillo Water Reclamation Facility by ENR Southwest. Working with the city and our JV partner provided the project team with opportunities to find solutions that put the community first in every way – from its design, during construction, and with the plant’s commissioning – neighbors and benefiting households are enjoying the rewards of the plant’s expanded the capacity, which added an additional 5 million gallons per day. In addition, safety was a priority on the project, which logged 473,000 work-hours with zero OSHA recordables. Congratulations to the city and our great partners on this important project! We congratulate our partners for receiving these major honors and appreciate being part of their success. A special thanks also goes out to the many, many subcontractor partners and their dedicated skilled workforce. You all were invaluable on each of these projects and every other project built across the country. It’s an honor to help bring world-class projects to communities throughout Arizona and around the United States!